which continues to be occupied by thousands of demonstrators. "You have arrived a little late, haven't you?" 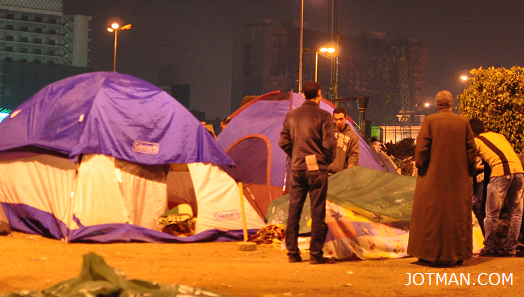 With these words, Q welcomed Jotman to the encampment at the center of Tahrir Square in Cairo. This is where would he would spend the night. Half an hour earlier, I had emerged from Sadat Station. In the underground walkway I had passed a boy carrying an Egyptian flag. He was accompanied by his parents. Surfacing, I saw a friendly looking Egyptian student. "What's the situation here now?" I asked him. Islam, which was the student's name, told me there was no trouble, everyone was being left alone. He emphasized that the army was their friend, and Egyptians were unified. Except for one problem: Ahmed Schafik, the prime minister. Schafik had to go. While we were talking, various people stopped by to welcome me. Mahmoud, a forty-something year old art curator introduced himself. "Behind where we're standing now were the hospital tents," he said. On hearing Mahmoud express doubt about whether future support for the revolution would be forthcoming from the army, Islam spoke up. Islam almost seemed to be reprimanding Mahmoud. "The army is on the side of the people," Islam corrected Mahmoud. They exchanged some words in Arabic. We stood beside a railing that lines the usually busy road that circles the grassy island at the center of Tahrir square. There were no cars, giving the four-lane road the false appearance of a no-man's land. Across the road, on the island, was the tent city. You could see people milling about around the tents. Headed across the street, several students approached us carrying a large road sign (photo). 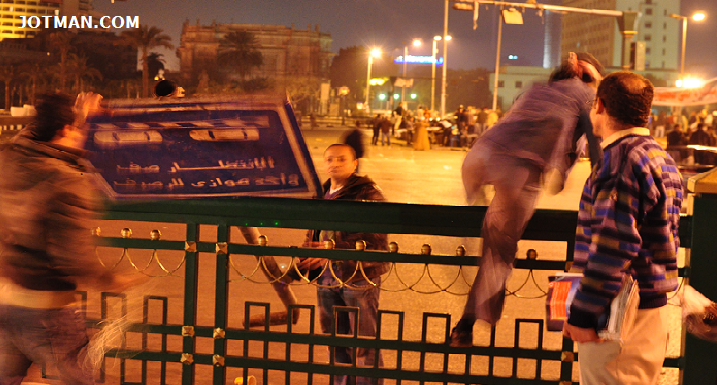 The activists were carrying a large road sign. Next a man approached us, having crossed the street from the tent city. The young man, I will call him Q, had an urgent message for me. "The curfew is about to begin. The streets will not be safe. I suggest you either get to your hotel. Otherwise you might want to stay here for the night." "Do you expect it will be safe? What about the army?" I asked. "The police have disappeared. The army doesn't come here. They leave us alone." "Some soldiers are stationed at road blocks down the streets." I had in mind the idea of heading to a hotel down one of those streets. But Q quickly put this idea to rest, "Any hotel in that direction is probably closed. I don't suggest you head that way." We discussed the question of me sleeping in the square, whether I was eligible or qualified. "I'll have to see if there's tent space available. But it shouldn't be a problem; in fact, I'd encourage you to spend the night here." Q went back to check, "I found you a tent." Once I had made it onto the empty street, Q said, "Do you have your passport? You're going to be asked for it. We have our own security people who try to make sure they don't send people here to make trouble." No sooner was I halfway across the road when a short round man approach us. "May I see your passport, sir?" I showed the jolly little guy my passport. Satisfied, he said, "Look at my passport. I work for the Egyptian Ministry of Foreign Affairs. See, it says so in my passport." Sure enough, that's what it said.